That’s one very interesting thing about classical music: It’s been around for quite a while, yet we haven’t managed to map what makes for longevity in repertoire. We think we know, but we can still be surprised. I love that. 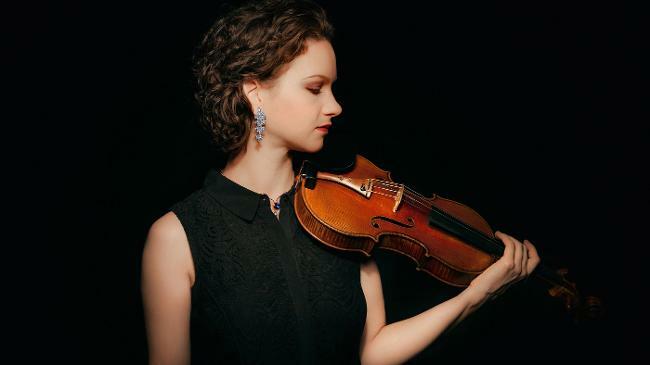 Early this last summer, violinist Hilary Hahn brought into this world her second child, another girl, but as if the labor of carrying, birthing, and mothering a child is not enough, there she is, at the end of summer, upon our stage as usual. It’s worth recalling at this moment that she has long supported and actively contributed to the benefits that “newcomers” such as infants can gain from listening to music, especially what we call classical music performed live—babies are truly “locked out” of concert and recital performances. And it’s also worth noting that the composer she has chosen to present, and in fact the one to whom she has chosen to return for her current recording release, is someone often known as “Papa Bach.” He was after all, in addition to everything else, a family man in the sense of being a reliable provider but also in having procreated twenty children, eleven of whom died early on, but nine of whom he raised to adulthood, and five of whom carried on in music. How does it feel, we might ask, to “grow up with Bach”? With Bach, you really can't hide, you have to think about everything. For me, the music seems to change with every concert — the balance, the voices, the melodies and lines take on a slightly different proportion each time I perform it… I really look forward to performing it — I know it's going to re-invent itself every time. And yet she still hears her own “common threads” in Bach as she listens to what she has played. 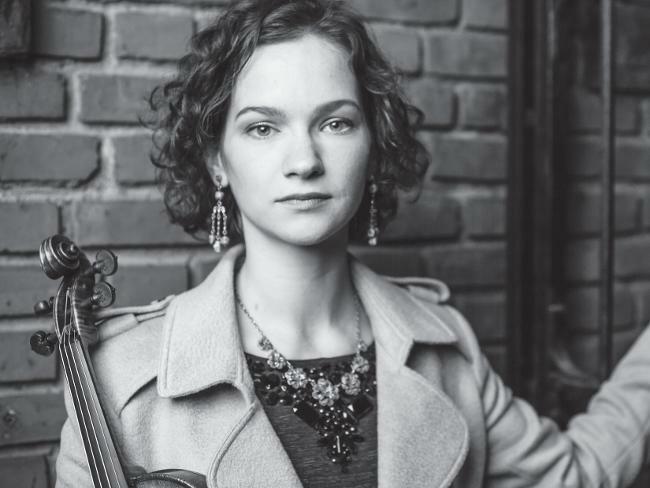 This month, as she returns to recording the second half of her Bach Sonatas and Partitas, she told Strad magazine, “It’s natural to restructure the architecture of your own interpretations a little bit, but that can happen day by day.” Fans look to Hilary Hahn for both her lyrical tone and her virtuosity. At the same time, they expect finesse in execution. In the case of Bach, that can mean runs, rapid turns, and bow crossings that are clean, clear, and crisp. Unlike his sonatas and partitas, Bach’s violin concerti offer a special texture. His Concerto in E Major provides a thrill for the performer in each movement. Part of the appeal is the way this music takes us to a place very distant from our own, in which Bach responded to the stability of his world order with ingenious spontaneity. From immaculate, incisive notes, the charismatic performer can achieve a supple grace. Hillary Hahn choses for her violin an 1864 copy of Paganini's Cannone made by Villaume (never letting it out of sight). Her Viennese strings have a synthetic core, Tomastik-Infeld Dominants for the A (aluminum wound), D and G (silver wound) and a Pirastro Gold Label Steel E, all of which add a modern brilliance to her performance. According to other noted violinists, the sonority can feel translucent; the fast notes can “sparkle.” Or one can play up the opportunity for Baroque ornaments and tempi, release the tension, and let the music “breathe naturally” (opting for gut strings used in historical performance). The challenge, then, is to create just the right intensity of sostenuto and vibrato while maintaining the vigor of a charismatic delivery. If the concerto after Bach showcased the soloist as a virtuoso, in his own time the principle was the soloist as merely the “first among equals” whose role was to add to the composition’s overall texture. Intricacy in the dialogue between the violin and the other instruments is what made the music. The violin floats through the melody of the Adagio at the center of the Concerto No. 2 in E Major, and Bach ultimately generates great spirit from the repeated bassline at its foundation. Bach’s Violin Concerto in E Major affords us some lovely melodies that tempt virtuosos to embellish them, but what characterizes the Concerto for Two Violins in D Minor is the chance for not only dialogue but duets and also duels. The performance begs to be assessed by the interaction of the two “soloists,” in this case Hilary Hahn and Margaret Batjer, concertmaster of the Los Angeles Chamber Orchestra since 1998, who has recorded this particular composition with Hilary Hahn and Jeffrey Kahane conducting LACO in 2003. The “Double” Violin Concerto opens with a fugue that is beautiful for the rapid alternation of separate melodies that at once deliver the sum of the parts. The humility of Bach registers in the tenderness of the Largo that lets the ear forget, for a moment, the masterly mathematical and architectural precision of his compositions. But from this “song-like” quality, the craftsman returns in the Allegro as the spirit rises. With these original violin concerti, written in a happy period of Bach’s life (1718-1723) in Cöthen where Prince Leopold enjoyed the new three-movement concerto Vivaldi made popular, Bach launched the German concerto into the Classical era. Bach was always looking for the limits of the instruments for which he composed, playing them himself and teaching himself what could be achieved. For an organist and harpsichordist, the violin was singularly high-pitched. Yet he tested the grammar, syntax, and vocabulary he was developing throughout his work, so it has been said that in these concerti it wasn’t so much violin music that he composed as much as it was “Bach written for the violin.” And in that language, we can dwell in the mystery of his music that extends from the mundane to the heavenly. Call it meditation or prayer, sometimes pure joy, but most musicians bow before it with complete humility. Violinists consider it music for life—there’s no running away from it. Many consider that even today, every composer has a relationship with Bach.